Jaap Sahib was composed under spiritual inspiration by the Tenth Sikh Guru, Guru Gobind Singh (1666-1708). In it are wave after wave of praises of the one God who pervades everywhere, from whom all religions have sprung, but who is formless, beyond our comprehension, beyond all sectarian doctrines. This great scripture is universal, transcending all religious boundaries. His Holiness Baba Virsa Singh, the revered teacher of Gobind Sadan, asserts that reading Jaap Sahib seven times daily leads to healing, relief from difficulties, and success in any endeavour. 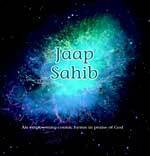 Innumerable people around the world who read Jaap Sahib attest to its power in their lives.